darkSpyro - Spyro and Skylanders Forum - Spyro: Year of the Dragon - Shower Thought: Is Enchanted Towers Too Long? darkSpyro - Spyro and Skylanders Forum > Spyro: Year of the Dragon > Shower Thought: Is Enchanted Towers Too Long? Shower Thought: Is Enchanted Towers Too Long? Just a random thought that entered my mind. Enchanted Towers is probably the most expansive level in Spyro 3. When I watch playthroughs of Spyro 3, this level always seems to take the longest to complete. Not to mention having to use 2 characters in the level, and the skateboarding challenges, and the rescue the wolf minigame. I know as a kid I always dreaded this level because of how long it took to finish. Question: Is Enchanted Towers too long? Y/N? Hmm, it is a pretty big level, but I wouldn't say that it's too long. Sure it is long, but I always found it enjoyable so I never felt that it dragged on. Keep in mind that I love the level nowadays, it's just as a kid I didn't look forward to it. Enchanted Towers has always been one of my favorite worlds because I just love the view of the entire landscape that is viewable from Sgt. Byrd's maximum height. I intentionally spent a lot of time in that world, my first time in it, in my first run-through just for that view. In my second run-through, the one in which I completed every world 100% before leaving it (though I believe I might have completed Enchanted Towers 100% in the first one just because I love it so much), it didn't feel like it took long. I even managed to get the skateboarding skill point in less than ten tries, I wanna say four or five whereas in my first run-through it had taken me forever. I have never felt that Enchanted Towers is too long of a level. I have actually always enjoyed it. And here are my reasons why. In Enchanted Towers the amount and versatility of the level content is a thing that never bores me. I love how many characters one can control in that level and how many different tasks one can complete in that level. I love how you can explore the areas and use normal Spyro gameplay methods to examine the area. And of course the Sgt. Byrd bits are just magnificent additions to the whole experience. The main level with Spyro and Sgt. Byrd alone are the reason to enjoy this levels potential. And of course the wolf mission is a nice thing. It was one of the first missions in this game in which I needed to think what to do next. It is not hard but it is definitely a fun break from the main level itself. And of course there is the skateboard mission which is one of my top favourite missions in the whole series. You can just play a mini skateboarding game and of course since at that time I was a Tony Hawk’s game fan I liked the hell out of that mini game. I always felt that trash master was under-valued move and up to this date I haven’t mastered 4x Twisted Lemon. But if you wan’t boring and overly long levels in this game, look no further than Spooky Swamp, Lost Fleet and Super Bonus Round. The Skateboarding in Enchanted Towers is one of my all time favorite mini-games as well. Although it took me forever to achieve the skill point the first time around, I never tired of trying. The height you get from that large pipe was always exhilarating. - Enemies which are large and attack faster than you can. Gotta wait until they attack to try to hit them. Plus, destroying the Sorceress statue at the end was obnoxiously loud and not even satisfying to do. But too long? I don't think that ever crossed my mind. In fact, if you go straight from the beginning to the exit portal, it's one of the shorter levels. Now this level is one of my favorites, and is exemplary for being the level that handles the additional player characters how they should have been handled in the first place. Imagine if there was a level where a significant portion was too high to reach, and thus Sheila was needed to get to them. Or if there were sections with indestructible chests and an area blocked by an armored big enemy, needing Bentley to access. Or if there were targets that were very much out of reach for Spyro, that Agent 9 could snipe and open up new areas. There's a lot that could have been done, but we only got Sgt. Byrd having tasks that Spyro can't reach in one main level. Yeah, I really liked the fact that Sgt. 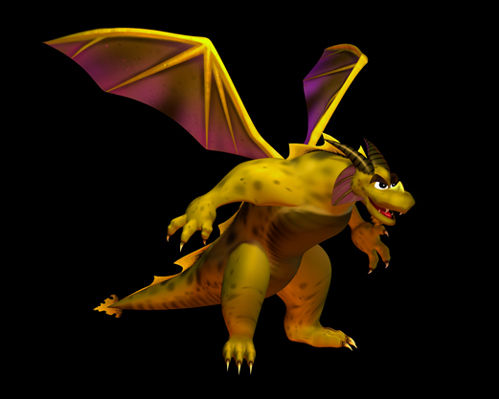 Byrd and Spyro play in the same level, rather than having a separate area for 2 different characters. Is this the only level to do that? I can't think of another time where that's the case. and is exemplary for being the level that handles the additional player characters how they should have been handled in the first place. Imagine if there was a level where a significant portion was too high to reach, and thus Sheila was needed to get to them. This is exactly how I felt about that ledge in Seashell Shores where you learn about hovering, that it seemed more like it was designed for Sheila's high jump. Spyro is barely able to maintain enough height when arriving at the ledge to get the benefit of hovering. I'd have loved to have more realms where the alternate playable characters were active in the main area, as this time around, particularly with the number of extra areas I've been able to enter prematurely to unlocking the necessary alternate character, I've noticed that you don't get much time with any one of them. This has always been one of my favorite levels in the Spyro franchise so I find I can complete it relatively quickly. Now, talk to me about some of the Midnight Mountain levels being "long" and I'd probably agree.